Totally off the subject of clothing/sewing/testing – I’m trying something new! Recently, I signed up to be a consultant with Rodan + Fields. I’m excited because, honestly, it’s a little out of my comfort zone (not the washing my face part of it – I’m good with that); I don’t consider myself a “salesperson”. However, lately, I’ve really felt the need to step out of my comfort zone and challenge myself to try things that don’t come first nature to me. The great thing with the R+F products is that they are really good and just talking with someone about them is about all of the “sales” I’ll need to do. I love that there is a 60-day money back guarantee – if for some reason you don’t like the products you get your money back. Did you hear that? You. Get. Your. Money. Back. Name somewhere else that you can get dermatologist-developed products risk-free. If you go to a dermatologist and they give you prescription for something you don’t get to fill it, try and go back to Walgreens to return it if you’re unhappy with it. You may wonder if Rodan + Fields is a fly-by-night company that just popped up to take advantage of peoples’ desire to improve their skin. Um, no. You’ve most likely heard of ProActiv – Dr. Katie Rodan and Dr. Kathy Fields are they original doctors behind it. They realized that there was a need in the marketplace for solution-based skincare. 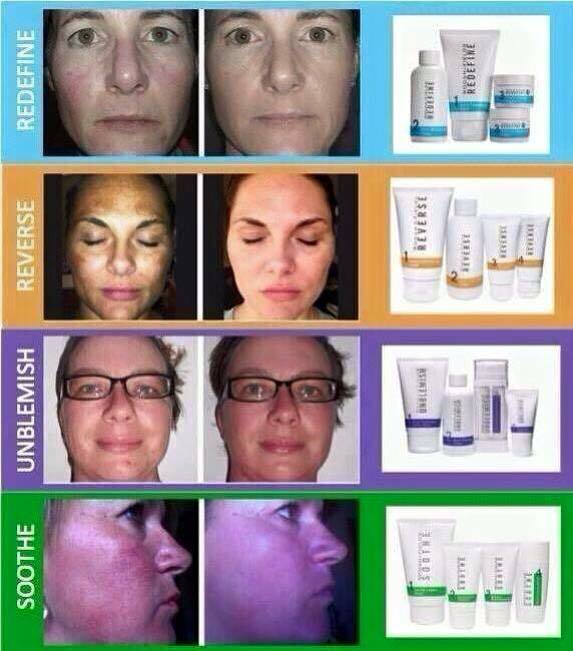 Have adult acne; sun-damaged skin; skin that is dull/lifeless and/or becoming lined/wrinkled; or red, irritated skin? There is a line of products for each of these with clearly defined steps to combat the problem. They’ve also added tools (roller, Macro-Exfoliator, Acute Care – a wrinkle filler) to aid in getting great results! Speaking of results, here is a quick picture showing results real people got from the four different regimens – awesome, right? I mentioned the 60-day money back guarantee but the other thing I love is that you can enroll as a Preferred Customer and receive free shipping as well as a 10% discount on orders BUT you’re not locked in to an auto-ship program. You continue to order what you need, when you need it! At 38, I can start to see my skin aging and it’s not my favorite thing that’s happened lately (unlike the gray hairs that are becoming more frequent or the challenge it is to lose weight – I SUPER love those things). Blah. If you’re interested in learning more about Rodan+Fields, whether we know each other really well or are just acquaintances (the old word for “Facebook Friend”), I’d love to talk with you! Enjoyed reading your blog, Amy! Fun!